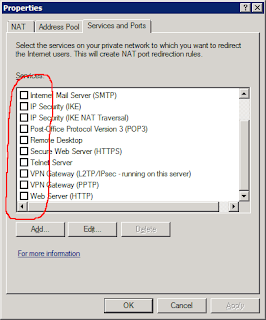 IP address and port forwarding in the Network Address Translation (NAT) feature of Windows 2008 R2 Server's Remote and Routing Access Service (RRAS) is surprisingly difficult to setup. Unlike previous versions of Windows Servers that I used before, the graphical user interface for NAT is simply broken in this version. With previous versions of Windows Servers, I could right click on the public interface under NAT, select "Properties" from the popup menu, go to the "Services and Ports" tab, and then specify how I wanted certain ports to be forwarded to another machine on the LAN. With Windows 2008 R2, however, the settings in on this tab do not seem to work. In fact, other than forwarding to local loop back address of 127.0.0.1, turning on anything here will only break things. Outgoing internet connection sharing works, but incoming port forwarding settings through this GUI are completely useless. We came to Windows from DOS, now apparently we are moving backwards.